I recently had the opportunity to sit down and chat with a new friend, the author of the fantastic Gutsy Girl book series, Amy Sullivan (@amylsullivan1). She asked some great questions so I thought I’d post them here, in hopes the might answer some of your questions too! 1.How did #hymnofthemonth start, and what does it look like now? Anyone who has babies knows that when they are tiny, and you are sleep deprived, you just want them to go to sleep in whatever way possible. At least that’s how it was for my husband and I. We were absolutely desperate for sleep. So we’d rock and pat, pat, pat and slowly peel one finger off of the baby at a time so as to not go and thwart this beautiful slumber that’s begun. You don’t think about doing anything elaborate or memorable before bed. Just get that child to SLEEP. But when our oldest daughter was 15 months old and our second daughter made her entrance, I came across articles about the importance of having a bedtime routine. Since I had been singing hymns my whole life, and had already established somewhat of a routine singing “My Jesus I Love Thee” thousands of times while rocking a fairly unhappy baby to sleep, I decided to make this into our bedtime tradition. It seemed the perfect way to end our day — in worship and in recognition of the Author of our days. We’d pray and sing one hymn a-capella all month long as we tucked our little girl into bed- which was just enough time for all of us to have the hymn memorized. 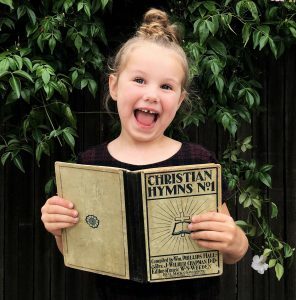 Then the next month we would choose a new hymn… And before we knew it, our 2 year old already had 10 hymns under her belt, with most or all of the verses memorized. As time went on, friends of ours noticed our little tradition and joined in… And in Spring of 2015 I posted about it on Instagram, and took a chance in inviting whomever wanted to, to come join us. I was absolutely floored when people responded and started memorizing hymns with us. I took it a step further this year and gave Hymn of the Month it’s own home on Instagram: Happy Hymnody. In total it’s been about 2 and a half years now and I’ve connected with so many sweet people through #hymnofthemonth. It’s truly beautiful to see that little community grow as we worship our King together. We are among many who desperately want our children to hide the Scriptures as well as these theologically rich hymns in their hearts. While much of the vocabulary is difficult for them now, a steady diet of that heart delighting – God glorifying poetry will be beneficial for them in the future. My oldest is now 7 and we are still singing a hymn every single night. It’s blossomed into something really beautiful over here. 2. Why should we care about hymns? As Christians we should care about theology. We should know our Bible and know the character of our God. We should also care about excellence, especially when it comes to theological expression… Hymns are theological poetry in song form. The words are rich and intelligently woven together. Simply put, much of the worship songs written these days are not great. While the music may make us feel emotional, much of the time they are void of good theology and super repetitive. Sometimes we just throw words in there simply because they rhyme regardless of whether or not they give an accurate description of God and His truth. Compare the God centered words of Watts, Cowper, Havergal, or Wesley to modern songs that are me-centered, repetitious, with tunes that are nice for listening but sometimes awkward and more meant for bands and soloists rather than congregations to sing together. I do think we can still write good songs today, and modern hymn writers are doing just that (i.e. The Gettys, Sovereign Grace, Indelible Grace, etc). There’s always room for more theologically-meaty hymns. And while some write new ones, others breathe new life into old hymns by giving them a chorus or a new tune. I think the Church should also care about our history and heritage. Many of these songs come soaked in a rich history that tells what our brothers and sisters in Christ have been through. And when we look into the author’s lives we can identify with their struggles and their longings. It is said that God Moves in a Mysterious Way was William Cowper’s last hymn during a struggle with terrible depression. “It is Well With my Soul” was written by a father, mourning the tragic loss of his daughters. Hymns have been written from authors reacting to slavery, struggling with illness and loss, being out in nature, experiencing the glory of saving faith in the gospel and undergoing terrible persecution. These writers, are our kin, our eternal family! We can benefit from their stories and their songs are just as applicable to our lives today as they were hundreds of years ago. 3. Do you have any favorite hymns which have been remade by current artists? Do tell! One of our recent hymns was “He Will Hold Me Fast,” originally written by by Ada R. Ha­ber­shon in 1906, and was originally set to music by Robert Harkness. I had never heard the hymn before but came across it a few months back when Norton Hall Band recorded it in a new musical setting by Matthew Merker. I love that it focuses on the perseverance of the saints – not a subject I see in many hymns! I pretty much love everything I hear coming from Norton Hall Band these days! Audrey Assad has recorded several hymns like Abide with Me; Holy, Holy, Holy; Be Thou My Vision, It is Well With My Soul along with a few others. Her voice combined with her amazing videos (via YouTube) are absolutely soul melting. I also love Sovereign Grace’s version of Cowper’s “God Moves in a Mysterious Way.” Such amazing words but in my opinion the original tune fell flat and didn’t capture the emotion of the words. This newer tune and chorus does a great job of that. Kari Jobe’s “Be Still My Soul” is also a favorite. 4. Do you have any favorite behind the scenes stories of famous hymns? 5. What are your top three favorite hymns? Hark the Herald Angel’s Sing by Charles Wesley – Seriously a theological mic drop and should be sung year round. That’s that! I loved chatting with you Amy! Do check out Amy and her awesome books via her Instagram or her website.